Diving is a hobby that transfers you to a new dimension where you can see another world and plunge into the energy of the ocean! 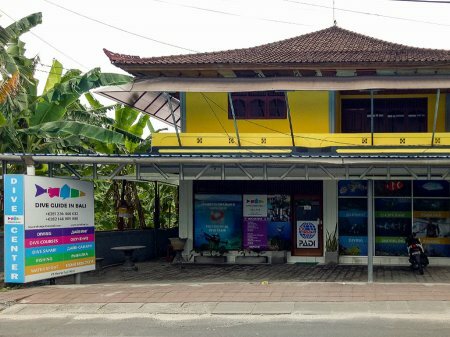 Diving in Bali is very good, many different dive sites have different characteristics, such as wall diving, drift diving, wreck diving, Bali macro diving, Bali muck diving, coral and fish of various colors and types, which refreshes our minds. A large variety of dive sites makes it possible to focus on the wishes and preferences of our guests that have different levels of certification. Giant mantas, reef sharks, eagle rays, turtles and octopuses, squids and cuttlefishes, mola mola and mandarin fishes, nudibranchs in a huge variety of colors and shapes, and pygmy seahorses of different kinds are just a few of the many creatures that live in the coral gardens of Bali. It’s time for you to see more! Explore the magical underwater world of Bali together with the DIVE GUIDE IN BALI team. News: WE HAVE A NEW ADDRESS! Dear friends! We inform you that our dive center has moved. And now you can find us at Jl. Pratama No.62a, Tj. Benoa, Nusa Dua, Bali, 80361, Indonesia. We work daily from 08.00 to 20.00.